I made the terrible mistake of having another crack at Dark Souls earlier this week, which has lead to much panic and consternation as I warily halberd-poked my way through the Undead Burg and into the sewage-and-curse-frog-filled lair of the Gaping Maw. This actually round about where I gave up on Dark Souls the first time, my fragile mind broken by the demand, but I'm willing to be patient and break through this time round. Only time will tell I can venture further into Lordran's madness. Aside from a few more games of Hearthstone, I've not played anything else. No, really! Nothing. Nada. Honestly, nothing at all. Nope. Oh okay... I PLAYED A SHITTON OF POKÉMON WOO! Pokémon X is pretty great. I'm not far in - only just after encountering Snorlax blocking the way forward on Route 7 - but I'm loving it so far. The music's fantastic, the visuals are gorgeous, it's a brilliant game just to gawp at. My team is slowly coming together, having just added a female Espurr to my roster, I've gurned like an idiot for god knows how long in Pokémon Amie, Punted footballs at Pokéballons to supertrain my Pokémon stats, got a hair cut, and of course, done lots of battling! I even caught my first ever Shiny Pokémon, a Furfrou I came across whilst hunting for a Skiddo to join my squad (see it above in all its glory!). And I may have also received a drubbing from the ODeck's premier Pokéfan Chrono - I was so close, damn you and your Braixen! - in an online battle, but let's not talk about that. If you're interested in sharing your Pokéjourney with fellow Odeckers, Zuldim made a post to collate 3DS friend codes so we can do battle and share silly Trainer PR videos and be generally nice to each other. Check it out! Although not as busy as last week, there's still a few notable releases this week, as we begin to settle down a little before the storm that is next month's Next Gen explosion. 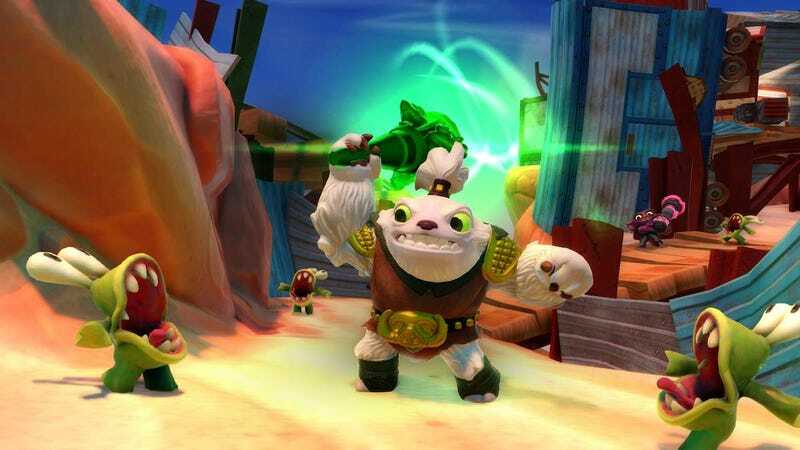 Leading the charge is Skylanders SWAP Force on 360/PS3/Wii/Wii U/3DS, the third entry in the toy-game hybrid franchise that has raked in oodles for Activision. The twist this time is that some of the new Skylanders toys can be separated in half and mixed and matched for platforming shenanigans. There is, of course, a ton of new toys out to go with the game, too. Kotaku's got a good rundown of just how much you can spend to feed your kid's, or your own, Skylander Addiction. Aside from Skylanders though, there's not much else - not content with the cashola they'll rake in from toy aisles this week, Activision are also putting out the latest entry in one of their long running FPS franchises: that's right, Call of Duty: Ghosts Cabela's African Adventures! Yes, it's time for more mediocre/hilarious hunting action. And finally, PC gamers get a treat with the standalone release of the brilliantly mind-boggling Half-Life 2 Mod The Stanley Parable with The Stanley Parable: HD Remix. Valve's weird-looking controller is put through its paces in a new demonstrative video - It's nice to see that not only does Valve's Haptic-feedback-based controller not only works, but works with a variety of traditional PC gaming genres, but man. I can't get over how discomforting it is to watch those thumbs not flicking over some joysticks. It looks creepy! My brain does not compute this! Watch_Dogs gets a shocking delay to Spring 2014 - Wow, now this was not something I saw coming. There have been umms and ahhs over Ubisoft's open world hacker game after some uncertain showings at recent public events, as well as the poor timing of being released not only alongside another Ubisoft open world game (Assassin's Creed IV), but also in close proximity to the open world behemoth that is Grand Theft Auto V. Let's hope that Ubisoft put that sudden wodge of extra development time to making Watch_Dogs a fantastic game. SWTOR's new expansion brings PVP... IN SPACE with starfighter dogfights - Actual spaceship combat in SWTOR, hooray! That's nice. Unfortunately EA and Bioware continue their terrible use of Free To Play that has plagued SWTOR since it made the switch - if you're a subscriber, you can start playing Galactic Starfighter early this December. If you're an F2P player? Have fun waiting until February! Guys, this is not how to do an F2P MMO. Frictional Games, the creators of the original Amnesia, reveal sci-fi/horror creeptacular SOMA - As someone who is easily petrified, I won't be anywhere near this, but a sci-fi game from the creators of one of the best Horror indie games in recent memory, I imagine this is going to be something of interest to plenty of people.